With Vertical Synchronization (VSynch), only whole images are displayed on-screen. The feature matches the timing between the displays' refresh rate and vertical blanking interval. Without VSynch, a high-performance graphics product can display extra content faster than the refresh rate allows, resulting in screen tearing. 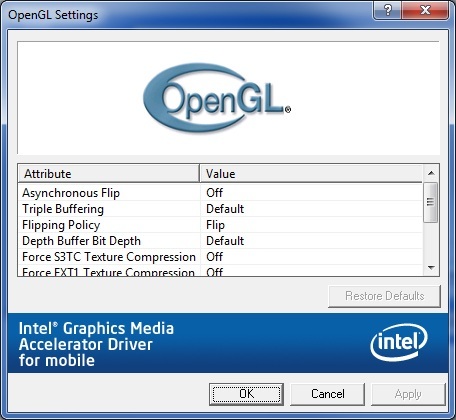 In older Intel® graphics drivers, this feature could be disabled for OpenGL* applications (not DirectX* games/applications). Newer versions of Intel graphics drivers have the option for either Always On or Application Controlled. The following steps outline how to enable or disable this feature. For the steps to follow, select the Intel® Graphics Control Panel used by your system. 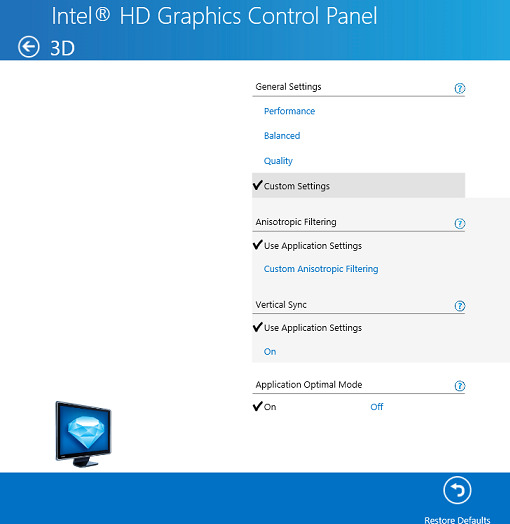 Intel® HD Graphics Control Panel VSynch can be set to Always On or Use Application Settings. The Use Application Settings setting means that VSynch can't be outright disabled in the Intel® Graphics Control Panel. The game or software being used must support full disablement. For games, this option is enabled or disabled via the game settings or configuration menu under graphics settings. In visual applications that use 3-D settings, look in the software's Preferences, Settings, or Options menus. Press Ctrl + Alt + F12 to open the Intel® HD Graphics Control Panel. Select General Settings > Custom Settings. Select either Use Application Settings or On. Note On sets VSynch to always enabled. Use Application Settings sets VSynch under control of the game or application that uses it. VSynch can be set to either Always On or Use Application Settings. VSynch can't be outright disabled in the Intel® Graphics Control Panel. The game or software being used must support full disablement. For games, this option is enabled or disabled via the game settings/configuration menu under graphics settings. In visual applications that use 3-D settings, look in the software's Preferences, Settings, or Options menus. Press Ctrl + Alt + F12 to open the Intel® Graphics and Media Control Panel. Select the check box for Custom Settings. Click the drop-down arrow under Vertical Sync, then select either Application Settings or On. You can enable or disable the option for VSynch in the game or application if the option is supported. 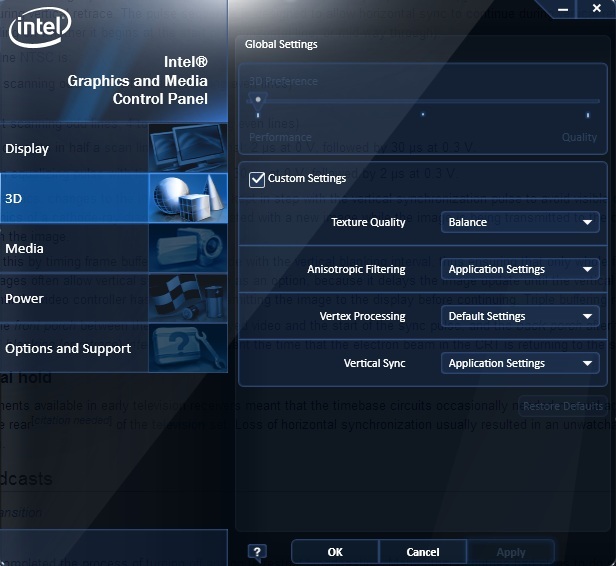 In this version of the Intel® Graphics Control Panel, there are no options for disabling or enabling VSynch for DirectX* games or applications. Press Ctrl + Alt + F12 to open the Intel® Graphics Media Accelerator Driver. Navigate to the Display Settings tab. Set Asynchronous Flip (or Vertical Sync for newer revisions) to On or Off.